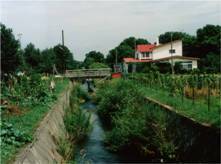 Moizari River, a tributary stream of Izari River in Eniwa City, used to be a rich creek where salmon spawned. 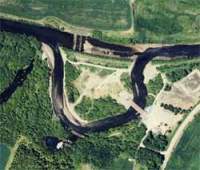 The river improvement construction was done from the 1950s straightening the river course and using the triple-phase method to keep the nearby farms away from floods, but the succeeding rapid city development lowered the flood control safety level. 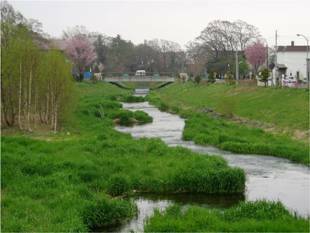 In 1986 the river improvement was restarted, which was certified in 1990 as the second “Hometown river model project” in Hokkaido. Various nature-based methods were introduced with the theme of “waterfront with no makeup,” integrating the river with nature and greenery. River-walk has also been prepared as a part of human-nature symbiotic city development. Shibetsu River has experienced constructions to straighten its winding stream to lower its underground water level, aiming at preventing flood and at better drainage of the basin, which was originally a peat district. Changes of the times have changed Shibetsu River’s requirements. With the local people’s voice asking for a better environment, Hokkaido Regional Development Bureau is working on a nature-restoring river development plan, aiming at restoring the nature-abundant original river conditions. 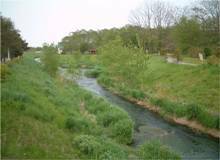 In order to research the effect of straightened streams, the winding streams are partially restored as an experiment. In Sarobetsu Plain registered under the Ramsar Convention in 2005, the land becomes dry progressively due to the agricultural land improvement for developing dairy and arid plants such as sasa veitchii are increasing in number. The lowering water level of the marsh caused by a drainage project for bogs along with the agricultural land development is another problem. Under the circumstances, the Sarobetsu natural regeneration project toward “coexistence of marsh and agriculture” is being conducted to recover the drying marsh and conserve the marsh by providing buffer zones in the agricultural land.